PassivHaus is an entirely voluntary building performance standard that anyone setting out to build a low-energy home might be interested in. It’s gaining lots of attention and is based around the principle of reducing heating demand to a very low level rather than relying on renewables. The standards far exceed most of the current Building Regulations, and it is popular because there are many different ways to meet the criteria. What is different about PassivHaus? It started life as a research project to determine just why so many previous attempts at building low-energy houses failed to deliver what they promised. The lessons learnt from this were then distilled into a set of guidelines about how to get it right. It’s very thorough and exacting to build this way, and numerous studies have shown that it works. How does a PassivHaus do this? The house must be designed from the ground up as a PassivHaus. There is a complex spreadsheet known as the PassivHaus Planning Package (PHPP) into which you feed all the relevant construction details: the insulation depths, the window sizes and orientations, the junction details, etc. This gives you a predicted space heating demand (expressed in kWh/m²/yr). You keep adjusting the design until your outcome meets the standard. PassivHaus can be built using almost any construction method. 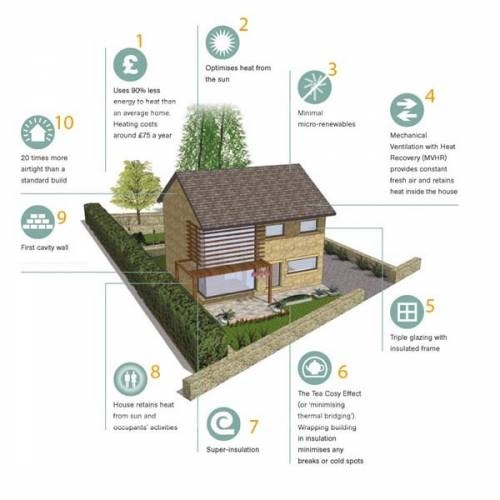 However, there are some universal features: massive insulation (average depth 300mm), triple glazing with insulated frames, fantastic airtightness levels (must score better than 0.6 air changes per hour), mechanical ventilation with heat recovery, etc. Uses 90% less energy to heat than an average home. Are they homes without heating? No. What the PassivHaus standard seeks to do is to reduce the space heating requirements to such a low level that you no longer require a conventional heating system. The level is set at 15kWh/m²/yr, and it’s the key PassivHaus target. That’s about a tenth of what a typical Western European home would use, and about a third of what many so-called eco-homes would consume. But it’s not no heating at all — that would be expressed as 0kWh/m²/yr. How is a PassivHaus heated? There isn’t a set method for achieving this and various ways of providing space heating are still emerging. The most popular seems to be adding a small heating element to the ventilation system, turning it into a warm-air heating system. These units are generally rated at no more than 3kW, and they only kick in when the outside temperatures are close to zero. You also have to provide for domestic hot water, so some form of boiler is useful. No. The definition of a zero-carbon house, arrived at in 2010, turns out to be much less exacting than the PassivHaus standard. For instance, the fabric heat-loss performance standard for the 2016 zero-carbon home has been set at 46kWh/m²/yr for detached houses. That’s still a demanding target, but not nearly as difficult to meet as the PassivHaus standard of 15kWh/m²/yr. The ‘zero carbon’ bit is then made up of a mixture of on-site renewables and carbon offsetting. In contrast, the PassivHaus standard doesn’t require any on-site renewables: it’s all about saving energy, not generating it. PassivHaus is an idea which works better for some than others. You need to learn how to ‘drive’ a PassivHaus — by knowing when to open windows, when to boost the ventilation system, when to change filters, etc. It’s not difficult, certainly no more difficult than getting your head around a car’s climate control system. But you do perhaps have to start thinking of your home as a machine for living in. You can’t just start knocking it about, adding new bits here and there. This may in fact be one of the major criticisms of PassivHaus — it’s not readily adaptable. Even things like running a cable through for a satellite dish is frowned upon. Sure, you can do what you want to your PassivHaus but it will cease to be a PassivHaus if you mess with it too much. Just like it will cease to act as a PassivHaus if you sleep with the windows open. So building a PassivHaus is a lot of trouble to go to if you don’t respect its integrity. However, the big plus for Passiv­Haus is that it works, and has been shown to work over a large number of buildings. Dit artikel is geplaatst in construction, tips&tricks en getagged alternative, building, change, construction, development, green, natural, passivhaus, preservation, science, sustainable, understanding, value. Bookmark hier de permalink.